Today’s post is by Guest Contributor, Glenda K. Harrison. 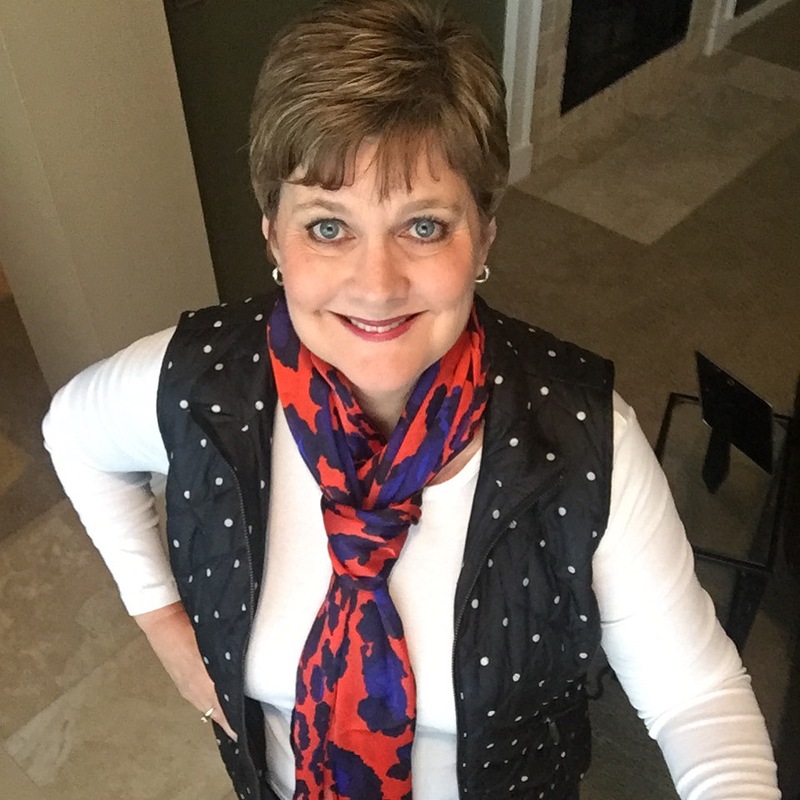 Glenda created the style blog, STYLE with Glenda K. Harrison. Through this platform, she inspires readers “to view fashion as an all-encompassing vehicle and encourages women to explore their personal gifts, style, femininity, and, most importantly, inner beauty”. 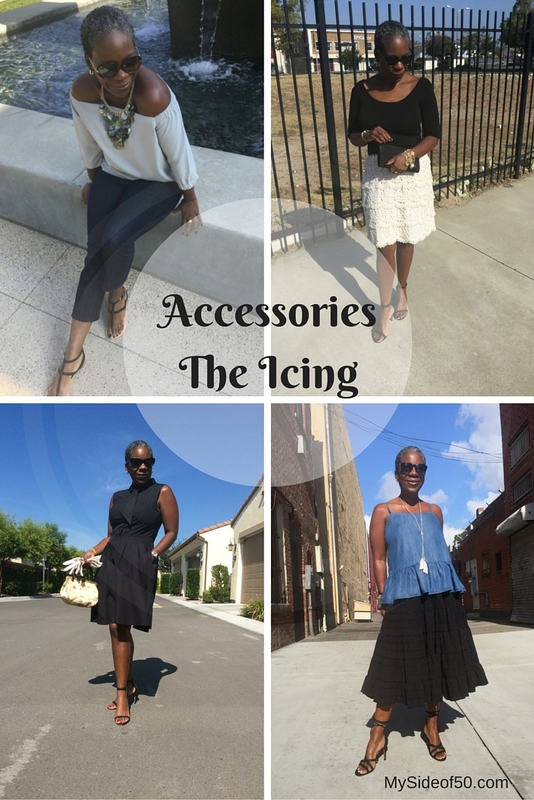 Her post today is all about accessories, or as Glenda calls them, the icing! Whether you enjoy accessorizing like over-the-top style maven, Iris Apfel, the elegance of the minimal approach like designer, Carolina Herrera, or somewhere in between – whatever your take, accessories are most certainly the icing on the cake. But here’s the most crucial fact about the icing – either it can enhance the beauty and flavor, or it can completely ruin the outcome. In other words, if you put the wrong jewelry, bag, belt, scarf, sunnies and shoes with your sartorial pursuits, you’ll completely destroy the look. Careful attention to these important details are ultra important, and must not be ruled as an after thought. Depending on the occasion, mood and story I wish to tell, I have dazzled with a variety of accessorizing techniques. However, in most cases, I tend to lean more toward a minimal approach to completing an ensemble. In my opinion, comfort is just as important as what you choose to wear. The idea of futzing with myself is out of the question. 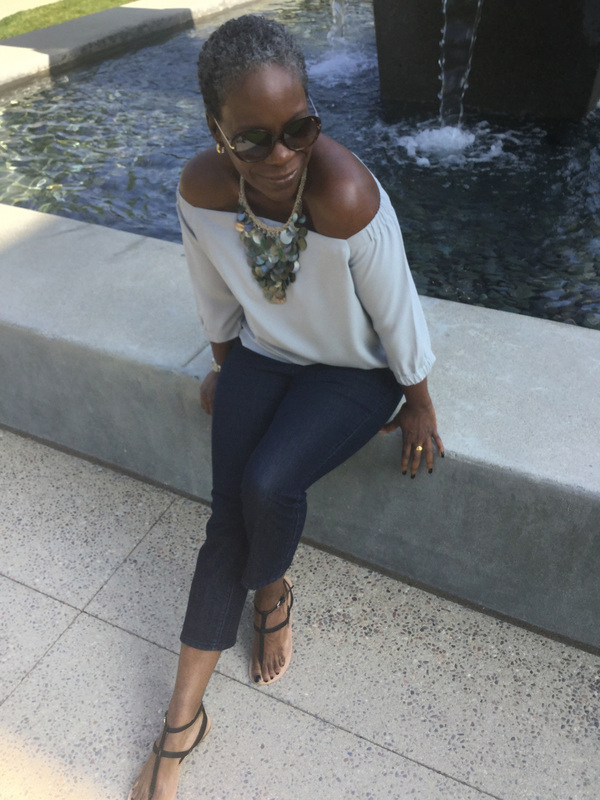 When I select what I’m wearing, I like for the entire look to flow seamlessly into my complete life, or better yet, my style story. 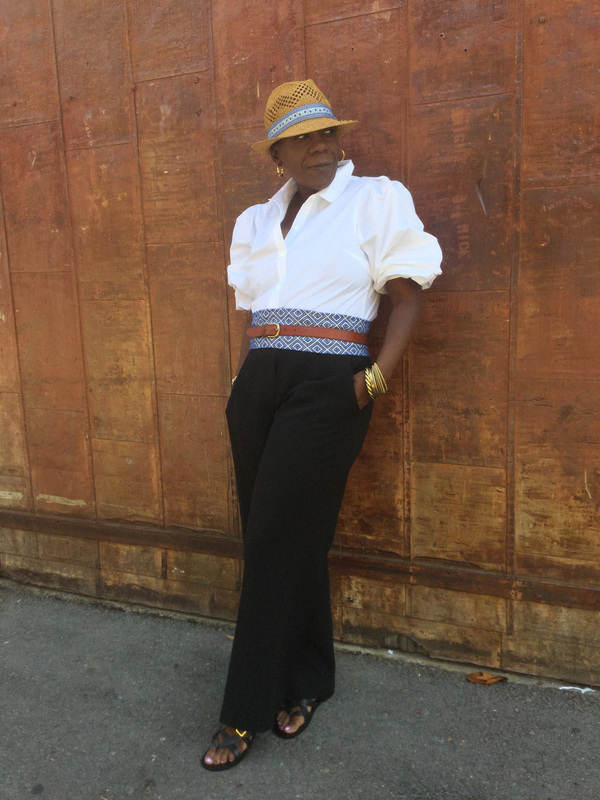 To better understand the concept of accessories completing my style story, I have selected 4 looks from my STYLE with Glenda K. Harrison archives. Enjoy! What better way to represent my free spirit than to dress in clothing that gives me the ability to do so – clothes that do not restrict, but swirl and dance in playful movement. Soft, artful layers glide over my silhouette – enhance who I am, rather than conceal. Tassel-tied shoes and jewelry are the perfect choice for such a bohemian inspired look – with just a loosening of the tie – they evoke thoughts of a life led free. A tie-neck detailed dress which evokes memories of the ladylike appeal of the 50s and 60s has been accessorized with items that continue to play with that particular era – Cateye sunglasses, a ladylike silk floral handbag, a pair of laser-cut gloves, and a necklace which was wrapped around my arm several times to create a charm bracelet. A beautifully constructed, dramatic necklace, in colors that remind me of cascading water, is worn to create an element of surprise in this calming and leisurely ensemble. Typically, when I expose my shoulders, I prefer to keep the entire area bare, free from necklaces, but with large hoop earrings. But for today, since I’m sporting such an artistic piece, accompanied with large sunglasses, I chose to scale back my earrings. The look represents an inner calm, yet it taunts my ability to make a statement…but in a reserved and quiet way. 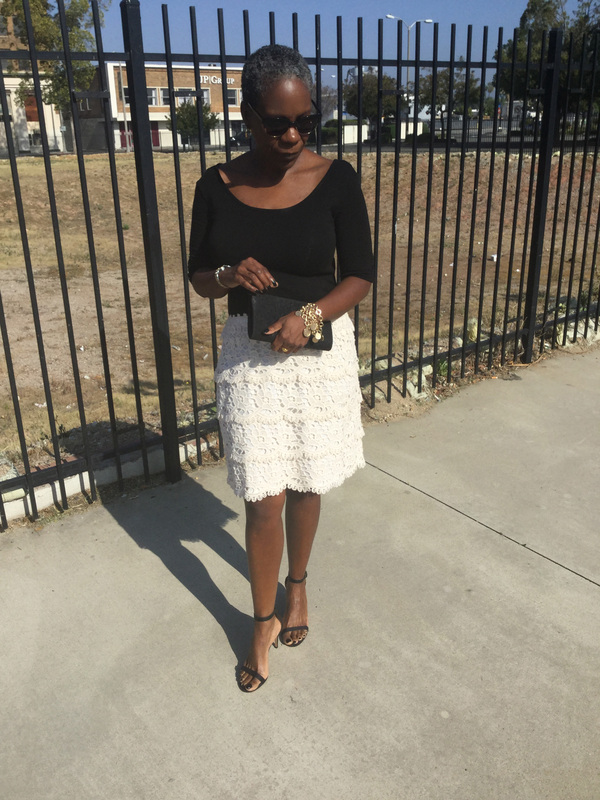 The look I’m wearing is classic, feminine, and minimal: A tiered lace skirt is accentuated by a fitted scoop-neck tee, barely there heeled sandals, and simple lace clutch. The hero accessory is a glorious, yet classic coin bracelet that makes a statement on it’s own. There’s no need to over adorn myself with multiple necklaces and a variety of rings – a touch of gold on the ear and one gold ring are all that’s needed. To capture the spirit of a Cubana, I decided to adopt a couple looks from the Chanel 2016/17 Resort collection. A straw fedora, a more masculine sandal, a Spanish-inspired corset, and added touches of antique gold jewelry take this look to another level of success. Without the accessories, I would be wearing a white top and black pants. There’s nothing wrong with that, but why not take your look up a notch or two. Have you updated your wardrobe for summer? What are the summer fashion pieces you can’t live without? Need some inspiration? 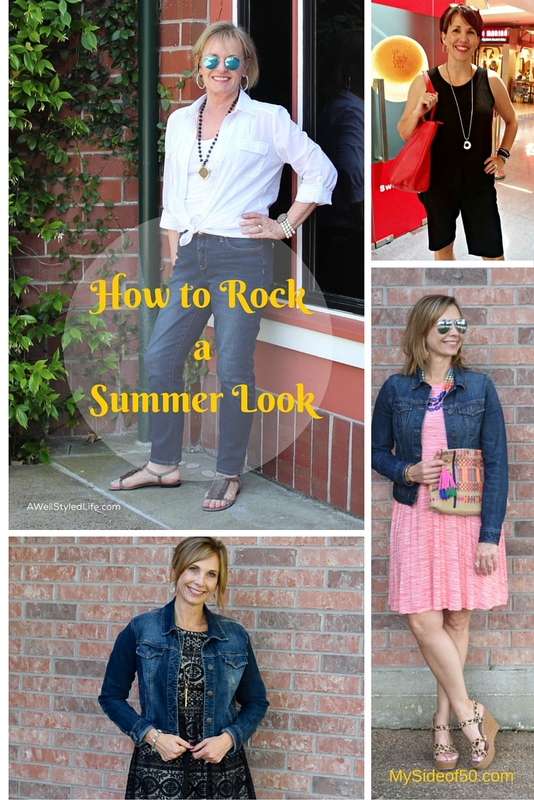 Check out these fashionable ladies – they are some of my favorite fashion bloggers. Jennifer Connolly – A Well Styled Life. Jennifer styled a white cotton voile shirt. Since Jennifer is an inverted triangle shape, she wears one or two sizes larger on top than on the bottom. She wore this semi-shear top over a V-neck tank . She prefers the V-neck because her shoulders are broad. Then she tied it at the waist which she says gives her waist definition and hides any “muffin top” action! Shellie Bowdoin – The FABulous Journey. Do you wear shorts? You can still wear shorts in midlife – you just have to find the right fit and length. Bermuda is Shellie’s favorite length. She says, “When choosing Bermuda shorts, pay close attention to the taper at the knee. If the bottom hem is too wide, the shorts can make your legs look shorter. 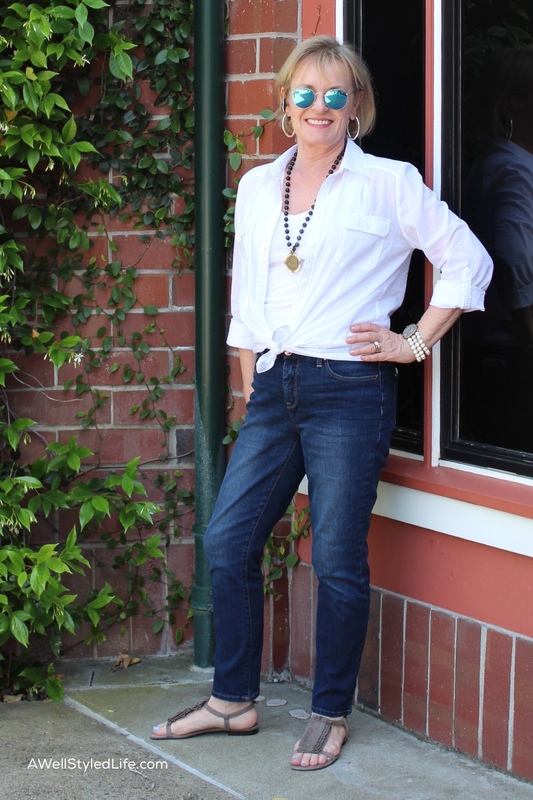 Sometimes I have my shorts altered to taper them in gradually from mid-thigh to the knee…The most flattering hemline should hit above the knee cap.” Shellie also goes for the monochromatic look in this outfit, which pulls everything all together and lends an air of sophistication. Shelly Janac – The Queen in Between. A great blue jean jacket is definitely a necessity. While we often think of denim as something casual in our closet it can also stand to elevate an ordinary outfit. 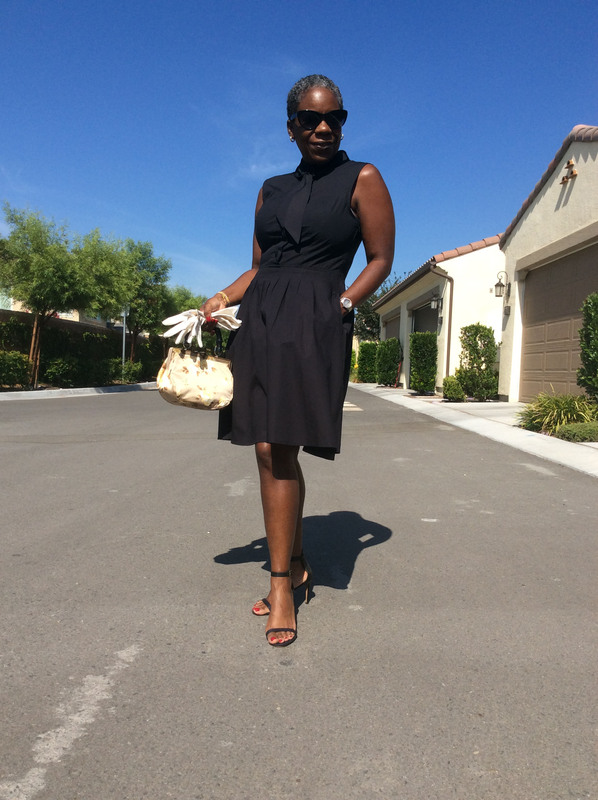 This particular look allows this sleeveless swing dress to become office appropriate and with a few accessories like a fun necklace, seasonal purse and stylish shoes. It looks completely pulled together. On the flip side, how many times have you purchased a dress a little more on the fancy side for a cocktail party or a wedding and didn’t find a way to wear it often enough to justify the cost. 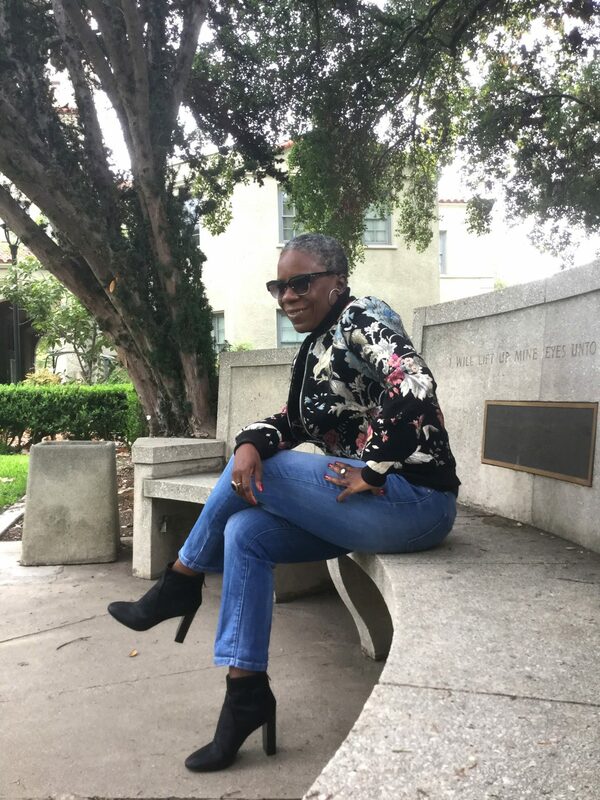 In this case, I used a denim jacket to bring this fun little dress down to a level I could wear to the office without feeling over the top! These ladies have provided me with a wealth of knowledge as I’ve tried to develop my own mid-life fashion style. Check out their blogs and follow them on social media to get their latest fashion tips. I’m a t-shirt and jeans girl. That is what I am most comfortable wearing. And as a blogger who works out of a home office, that is perfectly OK – while at home. But how does someone like me dress appropriately for other occasions in a way that gives me confidence and communicates who I am and what I’m about? 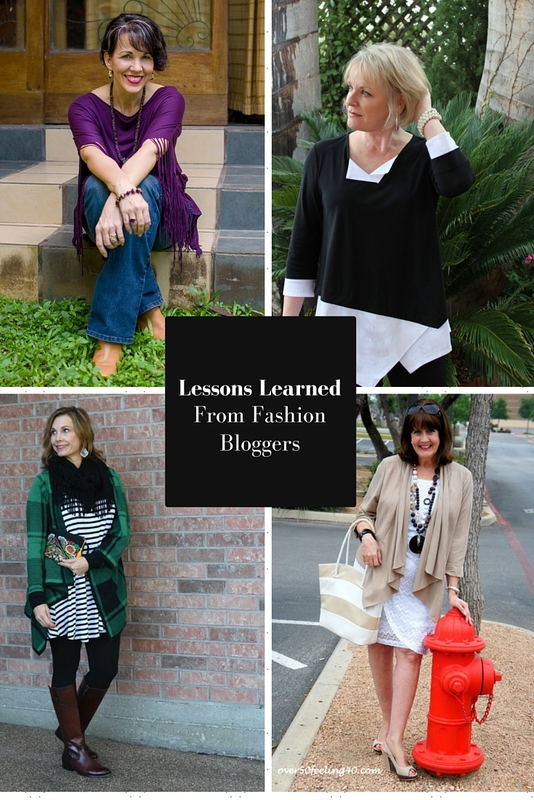 Here’s what I learned from four of my favorite Fashion Bloggers. 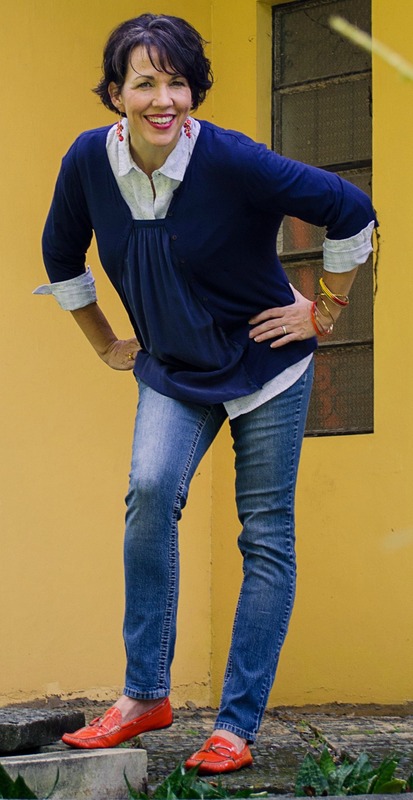 Pam Lutrell from Over50Feeling40.com was one of the first fashion bloggers I started following. At that time, I was a size larger than most of the clothes in my closet and was thinking that there was no way I was going to go shopping until I “lost 10 pounds!” Well, if I continued in that vein, I would be wearing about 2 things that were tight and uncomfortable all the time, because to date, those 10 pounds haven’t gone anywhere! 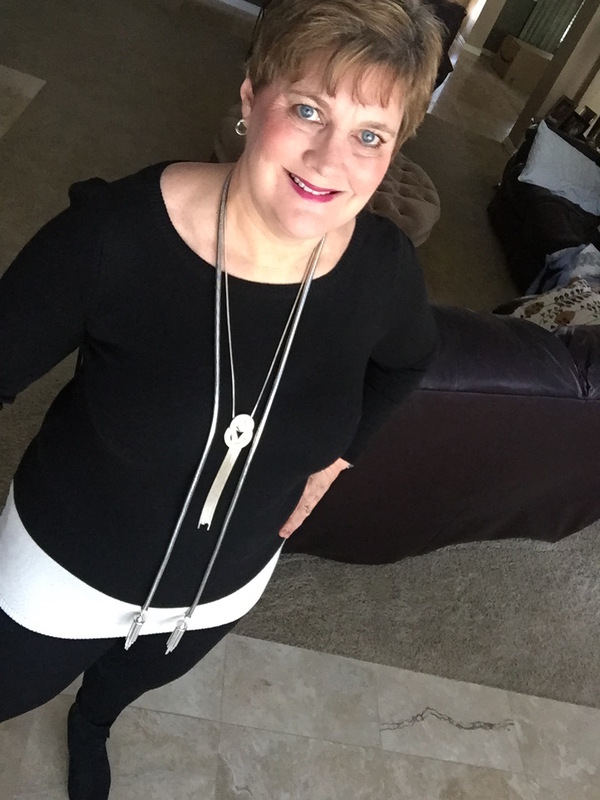 Pam Lutrell from over50feeling40.com believes that women can make fashion choices that make them feel confident not matter what their age, size or price range. 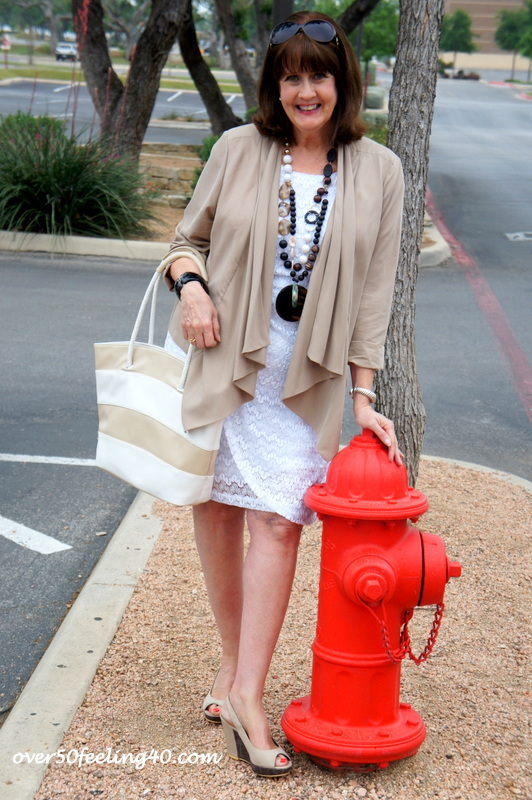 Pam wearing white, cream and tan with a statement necklace. Great picture by that red fire hydrant! 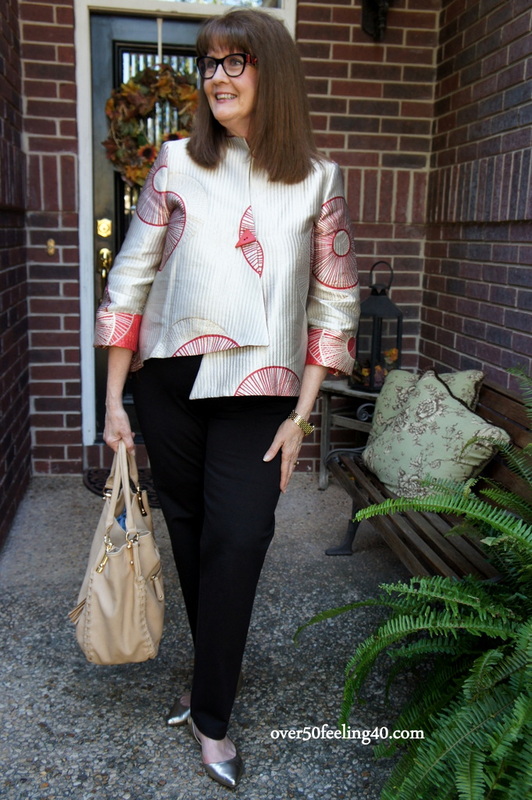 Each week, Pam does a feature with Jennifer Connolly of awellstyledlife.com called Style Sweet Spot. Here’s how it works – Pam and Jennifer pick an occasion that they are dressing for like a baby shower, trip to the museum or out for a casual dinner and show us what they would wear and why they made the choices they made. What I like about Jennifer is that she helps me understand WHY something is a good look. For example, I loved this top that she was wearing. 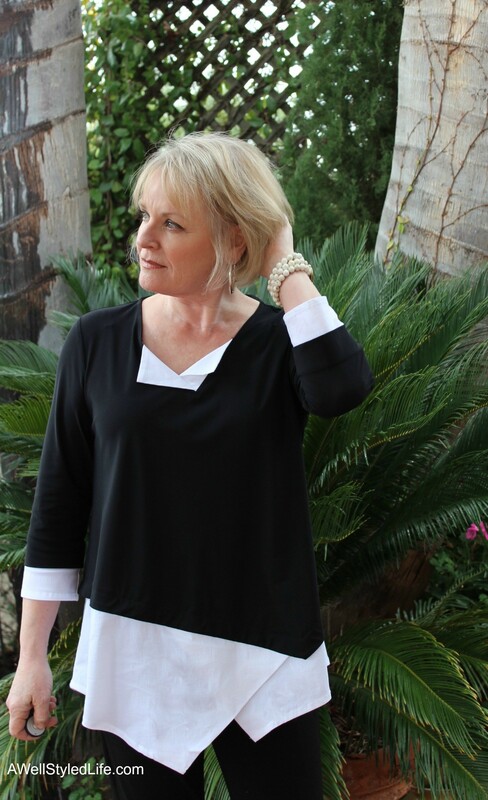 Jennifer Connolly from awellstyledlife.com plays with angles and proportion in this asymmetrical top. Jennifer said she was playing with proportion and angles when she chose the top with asymmetrical lines. I knew I liked it, but that little bit of a description helped me know WHY I liked it. And knowing WHY I liked it will help me look for those same features in a top in the future. In another post, Jennifer talked about how texture and pattern near a woman’s face can minimize the “texture” on her face. Don’t you just love that we can call it texture? Jennifer wears this textured dress over black pants for an afternoon baby shower. I tried the print near the face option with this heart-print scarf near my face for a girl’s lunch out. I tried pattern near my face in this heart-print scarf. Shellie Bowdoin* is from thefabjourney.com. 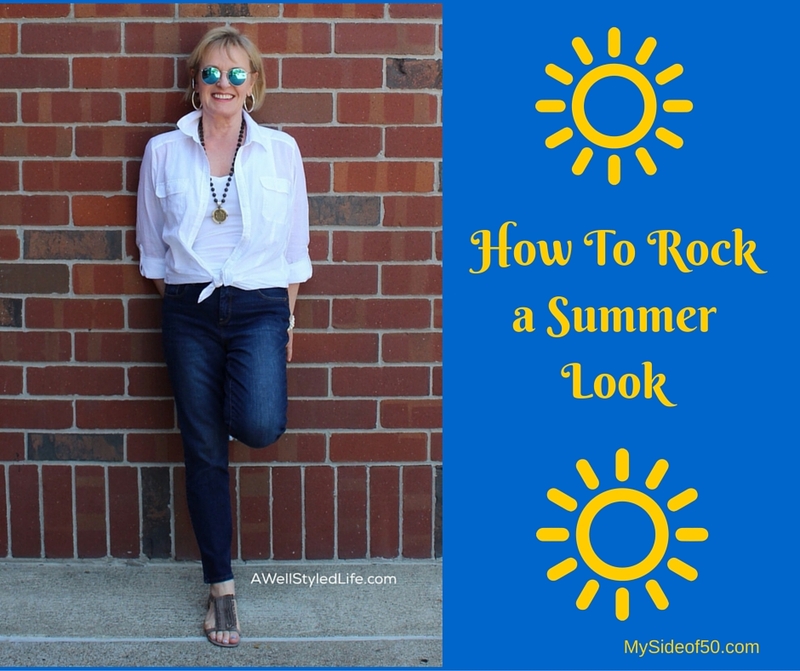 Shellie often posts looks featuring great basic pieces she has in her closet (in some cases she’s had them for years), with new pieces to make a great new outfit. Shellie models an animal print dress that she’s had in her closet for 18 years! Still looking good! This whole outfit came from Shellie’s closet and all purchase were sale items for Macy’s, Dillard’s Oulet or Goodwill. She has had those cute, orange Michael Shannon shoes for over 5 years! Her post “How to Shop as a Fabulously Frugal Fashion Hunter” inspired me to quit doing my usual, walk into the store and buy everything on the mannequin outfit and walk out. Whole outfit is several years old, except for the Kendra Scott necklace that my husband gave me for Christmas. The sweater, leggings, boots and necklace in the middle are all several years old. I added the Kendra Scott McKayla necklace that my husband gave me for Christmas and felt up to date and stylish for a Saturday luncheon at a country club! I first discovered Shelley Janac from thequeeninbetween.com on Instagram. She had the most marvelous looks that MIXED PATTERNS! This blew my mind – mostly because I am the QUEEN OF MATCHY-MATCHY and because in the “olden days” that was a fashion no-no! But Shelley’s looks were so fabulous and fun. So cute – small polka dots on the skirt with a striped top. The necklace is the perfect pop of color. So I put on my big girl pants and gave it a try for a Saturday shopping trip. I paired a navy polka dot vest with a red and blue print scarf. Polka dot vest with scarf in complimentary colors. This was way out of my fashion comfort zone, but when the sales guy at White House Black Market complimented my look, I knew I had arrived! LOL! So…thanks to these ladies for their wonderful websites and their great fashion advice. There may be hope for me yet! I hope you will follow their blogs and social media accounts. You’ll be inspired to up your fashion game! Do you ever feel like you are in a fashion rut? 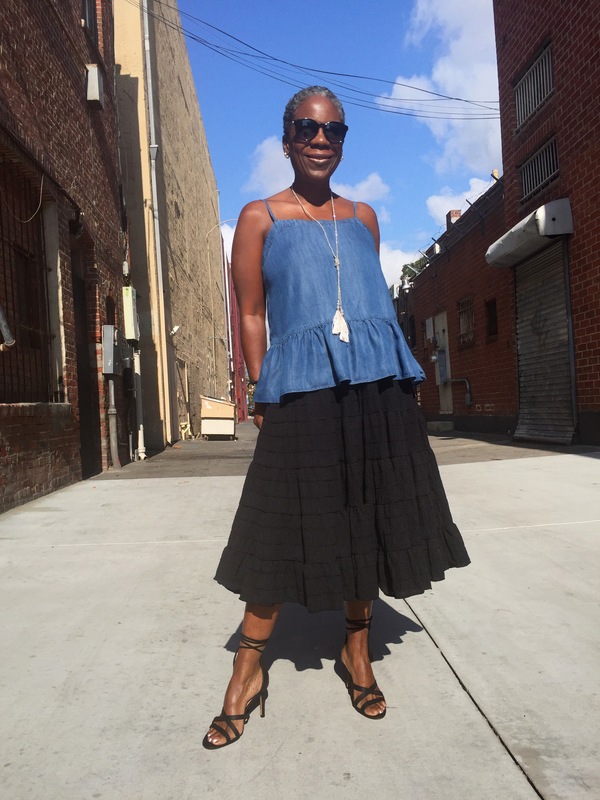 What’s the hardest thing about styling your over-40 self? 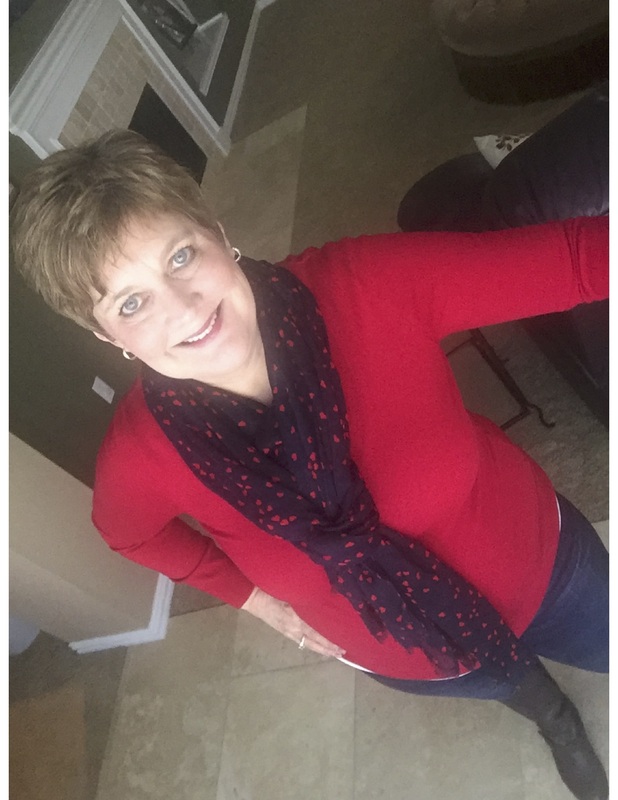 *Shellie recently interviewed me about a mid-life perspective on body image and weight loss. You can read the interview here.